We recently answered the question How can a City establish a ‘beta community’ to attract the creative class? with an outlined process. We follow that with a living example, Vauban in Freiburg, Germany.. 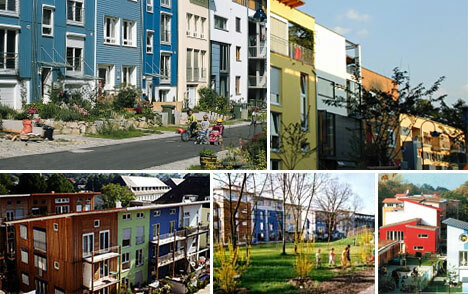 In the 1970s the City of Freiburg in Germany became known for its progressive mindset, much like Berkelely, CA. With that kind of creative foundation, when a 94-acre army base closed in 1991 it was a natural step for the surrounding residents to establish what was pretty much a beta community. Recognized and respected as a group of future tenants, they actually partnered with the City (which bought the site) to co-design and co-develop the base into what is today a pedestrian-oriented urban village of 4700 people, with 600 jobs. The best part of this ongoing story is that the residents thus get to live in the kind of community they truly wanted – and in this case, that means one with well more than four times less cars than the typical U.S. city (almost three times less than the average Freiburg locale). In fact, because of its pedestrian-oriented character which is inherently urban in fabric, Vauban has become known as a kid-friendly community. Makes more sense than U.S. logic that auto-oriented neighborhoods (ie suburbs) are better for kids. It would be an interesting study to find out how many kids die from car accidents in the suburbs compared to urban centers. How safe are our suburban developments are compared to city centers.